I snapped this post box one morning last week or so – it’s the one in the wall on Marine Road and one of the older ones that we have here in Hoylake. I reckon those initials are ER V11…for Edward 7th (1901-1910). That would make this post box over 100 years old. One hundred and more years of birthday and Christmas cards, job application forms carefully completed by typewriter and Tipp-Ex, Spot-the-Ball competition entries, get well soon’s and thank-you’s, pen-pal correspondence to a girl in Luxembourg, Valentine’s, love letters to soldiers fighting World Wars overseas or maybe adoring fan mail to The Beatles or Duran Duran. An endless and really quite fascinating list and a reflection of changes in society over the decades when you stop and think about it. But what caught my interest in our local post boxes was a newspaper article that I read while on holiday about Royal Mail electronically tagging traditional red post boxes. 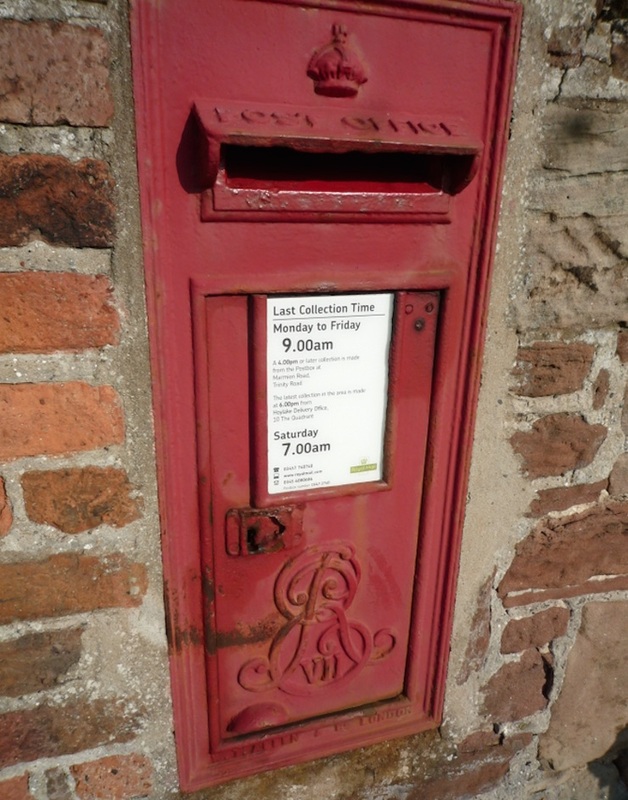 Apparently old and rare post boxes are stolen by gangs and sold for a much as £5000. Over 100 red post boxes are stolen each year and Royal Mail is now planning to use high-tech solutions in an attempt to deter the thieves. Hopefully our local ones are safe and secure? The post box outside Royal Liverpool Golf Club is an older VR (Queen Victoria) model and looks resplendently red having been repainted after some idiot decided it was a great idea to spray-paint it last year. Though it’s a real shame it has that ugly box stuck on the side of it. Can’t something be done about that as it’s in a conservation area? Perhaps someone could write a letter and complain. I seem to recall stumbling upon a website ages ago that had a location map for post boxes across the country but actually it’s more fun to spot the not-so-obvious ones when you’re out and about. Apparently there’s a post box within half a mile of nearly every home (98+%, exclusions might be Scottish islands) in the UK and since the privatisation of Royal Mail that’s a legally binding requirement. I guess that would easily apply to everyone in Hoylake? There are new’ish ones about too. One was placed in Bennetts Lane, Meols a few of years ago (mentioned on my neglected Meols site). And I think the one down Stanley Road that’s decorated with tinsel at Christmas has been replaced with a new model at some point. I could become a post box nerd!